In the motif from Sørup Vang the irregular lines of the landscape, the irregularities of perspective and the wide or oblong fields of light and shade that arise as a result of the forms of the landscape have caught the painter’s interest. The picture reminds us that Lundbye was not under the influence of Eckersberg’s strict, systematic rules for the construction of space with linear perspective, but placed the emphasis on the distinctiveness of the landscape. The road that winds to the right in the painting is almost a fixed element in Lundbye’s landscapes. The road was a highly meaningful motif for him, and in the diary he kept from 1842 until 1844 he constantly used the word vej (“road” or “way”) as a metaphor for everything that had to do with a process or a development. He used the word both of his work as an artist and in general about the stages of life, and as a rule he found the road difficult to follow, both in the course of his artistic career and in his attempts to come to terms with himself in the ethical sense. 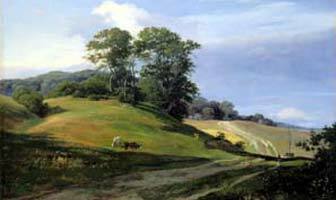 Lundbye’s paintings are very much associated with the National Romantic landscape. He evokes the image of a conflict-free idyllic Arcadia, which for the present-day observer takes on the character of a lost harmonious universe. In the National Romantic landscape the chores of human beings go hand in hand with the life of the animals, and although the monumentality of nature sometimes makes the figures almost vanish out of the canvases, the idyll is not destroyed. The region around Frederiksværk in northern Zealand was a recurring motif for Lundbye. After his father had been posted there in 1836 as an artillery officer, Lundbye spent periods in the town and its surroundings, and painted pictures like this.